This is a disc especially notable for its promotion of the Viola Concerto – or more properly the Concerto for Viola and Piano accompanied by wind instruments and percussion of 1954-56. I’m not aware that it’s been previously recorded and though Capriccio doesn’t proclaim it as a premiere recording on the box they do in the booklet notes. This company has demonstrated its commitment to Hartmann before, not least in the Spivakov/Conlon disc of the Concerto funèbre, coupled with the Second and Fourth Symphonies. This is the string opus most associated with him of course. The later work for viola and piano is of an entirely different sort. It was written for William Primrose. Like the question of recording I’m not aware that the Scotsman ever played it, though he was certainly supposed to give the premiere in Frankfurt am Main in May 1956. As he was ill his place was taken by Jascha Vleissi. Primrose makes no mention of Hartmann in his autobiography. The single most pronounced influence on the concerto is that of Berg’s Chamber Concerto. The oscillation between terse and lyric is in the hands of the viola soloist; the piano’s subsequent entries add percussive colour. I must note straight away that the balance between the two instruments and the orchestra has been excellently realised. The Melodie central movement encapsulates the complex textures and procedures to which Hartmann has submitted his material. Percussive moments become overt, melodies are long-breathed but difficult, polyphony is pervasive. There is maybe some Blacher influence in the finale, a Rondo of tightly constructed and rhythmic incision. The Bartók influences are not obvious though they do also exist. The path of the work is rather binary, with both solo instruments engaged in their own rather individual battles. It’s played with total commitment and facility by the soloists and orchestra under Janowski. And yet one can’t pretend it’s an easy or phlegmatic listen. The Sinfonia tragica has a somewhat complicated history. This dates from 1940 with some revisions made in 1943. The first movement was then later utilised for the Symphony No.3. The 1940 version was originally planned to be performed in Brussels in Paul Collaer’s Musique 1941 concert series – the work was dedicated to him – but the performance was cancelled. A subsequently scheduled 1946-47 premiere in the same city also collapsed because of the loss of the score. It wasn’t until 1973 that it was found in the archives of the Belgian radio broadcasting company. Berg and Stravinsky haunt some of the writing; the opening is tense, brittle and allusive. The tightly argued echoes of Webern are embedded in the score but the defiant assertion of the Rite of Spring allusions (try Movement 1; around 9:40) are the most striking and emblematic. The second of the two movements is snarling, martial and inflammatory in places – it doesn’t open Tumultuoso for nothing – and in certain places it also suggests Janáček’s Taras Bulba. Once again there is no let-up in the formidable energy levels displayed by the Berlin Radio Symphony and Janowski. 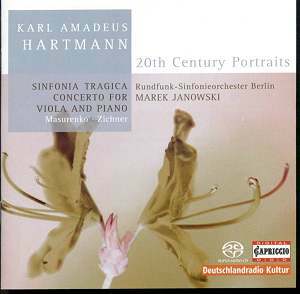 The first ever recording of this was by the Bamberg Symphony and Karl Anton Rickenbacher on Koch Swann CD 312952 and it was coupled with the Second Symphony and Gesangsszene. SACD has given the Berlin performance a powerful presence and its uniquely valuable coupling is a must.